Presented Annually to a member in good standing who has entered six or more prints during the current year in the Quarterly Photographic Image Competitions held in March, May, July, and September of each year. In the event of two or more members earning equal merits; each member receiving the highest total Image merits in that category will share the award equally. Overall Photographer of the Year based upon the highest total image scores earned during quarterly competitions of that calendar year. The top six scores are totaled, at least four of which must have been 80 or above. Divisional trophies are awarded to members who have highest image scores earned during quarterly competitions in each division (Wedding, Portrait, Landscape/Pictorial/Fine Art and Commercial/Industrial). Overall Photographer of the Year may also receive one of the Divisional awards. In the event of two or more members earn equally high image scores, each member receiving the highest total image will be awarded Trophies. Awards are given for both category-level and division-level achievement. Additionally, some awards are non-divisional and may be drawn from the pool of eligible images regardless of category or division. 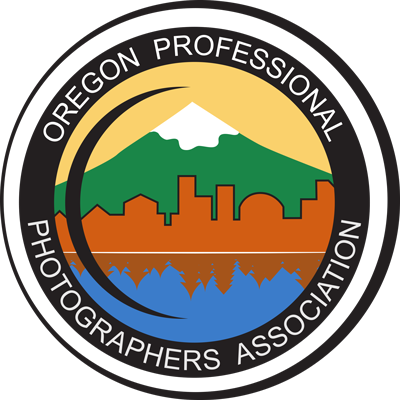 These awards include but are not limited to Best First Time Entrant, Best Color Image, Best Black and White, ASP Elite, CPP award. Presented annually to active members who excel in the Annual Open Competition. Membership dues must be paid by the Annual Open Competition entry deadline to be eligible for trophies. Awarded to the image selected by the OPPA President & Judges at the Annual Open Image Competition. Only images that score 80 or better are eligible to be selected. Based upon highest total Merits earned December of prior year through November of current year. In the event of two or more members earning equal merits as defined above in this section; each member receiving the highest total merits will share the award equally. Presented to the member deemed to have contributed the most significant amount of photography related value (services or physical assets) to community service during the year. In the event of two or more members contribute equal value to the community; each member will share the award. Contributions can be in the form of time or services offered for free or at deeply discounted rates, or contributions can be physical assets donated such as prints, equipment, etc. There are no fixed criteria other than it must be photography-specific. The value of the time (services) or assets donated will be determined by the member. If the charitable work involves a member shooting an event the time donation should not be communicated to the organization as officially “sponsored” by OPPA. Please complete the application form with a brief set of questions. Either electronic or paper submission is acceptable. The form must be submitted by the due date given. Applicants can be nominated or submit the application on their own behalf using this PDF Application. Please send your completed form to the OPPA Awards Chair, Nancy Smithman. An OPPA member in good standing. Presented to the member/photographer deemed to have contributed the most significant amount of time and willingness to mentor others in their photography during the year. Based on member submission of mentorship activities. The Awards Committee shall make a selection of the most worthy candidate, based on information provided by the members and research/discussion by the committee. Time spent in classroom/workshop settings is generally not considered to be mentorship. Please complete the application form, which includes a brief set of questions. Either electronic or paper submission is acceptable. The form must be submitted by November 18.